So I’m a pretty big Radiohead fan and apologist. Despite that, I have begun to sadly acknowledge that the band failed to live up to the promise of “the world’s first newspaper album.” 1) the regular updates (e.g. the state of the music at the time) did not materialize, and 2), their claim to “first” was off by almost 40 years. 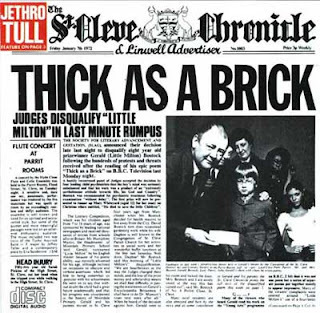 Check out the cover of Jethro Tull’s Thick as a Brick, with the inside liner notes presented in a similar newpaper-y style. Jethro Tull even put classified ads and in cheeky meta/pretentious move, a review of the album. What both newspaper albums have in common, though, is really good music on the inside. Jethro Tull catches some grief for winning the Grammy for best heavy metal album over Metallica. Well, I am not really sure that it’s the band’s fault that the Grammy voters had no clue what’s going on. Additionally it was the Black Album for God’s sake. Some that people tend to forget about Thick as a Brick as the entire album is one track, no cuts (though it certainly wasn’t recorded that way). My old CD has no cuts at all in it. The classic rock staple is only the first three or so minutes of the album. That was certainly surprising to me the first time I heard the complete album in 1997. Additionally, singer Ian Anderson’s use of the flute can sometimes give JT songs a very renaissance faire-type of atmosphere, with may sound warm, quaint, and inviting, or trite and grating, depending on your preference. I tend to lean toward the former, but couldn’t blame you if visions of Men Without Hat's Safety Dance invading your head. For an album that presents itself as one continuous song, I was also really surprised how smooth it is on the ear, without any intentionally jarring instrumental interludes or seemingly forced transitions. In fact, it is overall a very linear album, which is probably best heard in its entirety (as I’ve put below). The whole thing only lames out from 21 till about 27, during which there is some strange jamming, drum solos, and the entire recording seems to crap out twice. Additional, there is a transition very close to the end that sounds like an electric zipper that I hated when I first heard it, and still do to this day. These are minor flaws, but do distract from the listening experience. Luckily, the second half is generally a very pretty section that is both ambient, folk-prog, and what I guess Grammy voters thought was proto-metal, thus setting the stage for future heavy metal dominance in 1989. Check out the obligatory flute solo @ 36 minutes, which manages to be both silly and rocking at the same time. Although this is a really good album, and worth 43:50 of your time for a listen, I certainly wasn’t inspired to get more into Jethro Tull, which really should be a positive outcome of listening to the work of a good band. And although JT definitely had some good albums and singles, Thick as a Brick really represents a band firing on all cylinders. And that’s a topic for a future RTR. My guess is I’m not going to find Nothing Else Matters as heartfelt and profound as I did when I was 12.